DHCPv6 | CCIE, the beginning! The lab covers a scenario of adding basic IPv6 access to an existing PPPoE (PPP for IPv4). PPPoE is established between CPE (Client Premise Equipment) the PPPoE client and the PPPoE server also known as BNG (Broadband Network Gateway). PPPoE server plays the role of the authenticator (local AAA) as well as the authentication and address pool server (figure1). Obviously, a higher centralized prefix assignment and authentication architecture (using AAA RADIUS) is more scalable for broadband access scenarios (figure2). For more information about RADIUS attributes for IPv6 access networks, start from rfc6911 (http://www.rfc-editor.org/rfc/rfc6911.txt). PPPoE for IPv6 is based on the same PPP model as for PPPoE over IPv4. The main difference in deployment is related to the nature of the routed protocol assignment to CPEs (PPPoE clients). IPv4 in routed mode, each CPE gets its WAN interface IP centrally from the PPPoE server and it’s up to the customer to deploy an rfc1918 prefix to the local LAN through DHCP. PPPoE client gets its WAN interface IPv6 address through SLAAC and a delegated prefix to be used for the LAN segment though DHCPv6. Let’s begin with a quick reminder of a basic configuration of PPPoE for IPv4. Create a BBAG (BroadBand Access Group). Assign a loopback interface IP (always UP/UP) to the virtual template. Create and assign the address pool (from which client will get their IPs) to the virtual template interface. Bind the virtual template interface to a physical interface (incoming interface for dial-in). The virtual template interface will be used as a model to generate instances (virtual access interfaces) for each dial-in session. As mentioned in the beginning, DHCPv4 is deployed at the CPE device to assign rfc1819 addresses to LAN clients and then translated, generally using PAT (Port Address Translation) with the assigned IPv4 to the WAN interface. You should have the possibility to configure static NAT or static port-mapping to give public access to internal services. IPCP (IPv4) negotiates the IPv4 address to be assigned to the client, where IPC6CP negotiates only the interface identifier, the prefix information is performed through SLAAC. 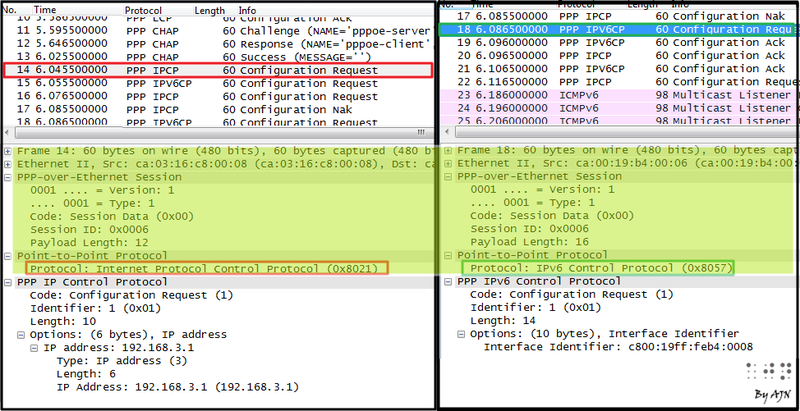 Note from the below traffic capture (figure5) that both IPv6 and IPv4 use the same PPP session (layer2 model) (same session ID=0x0006) because the Link Control Protocol is independent of the network layer. The advantage of using DHCPv6 PD (Prefix Delegation is that the PPPoE will automatically add a static route to the assigned prefix, very handy! Now the PPPoE client can use the delegated prefix to assign an IPv6 address (::1) to its own interface (fa0/0) and the remaining for SLAAC advertisement. No NAT needed for the delegated prefixes to be used publically, so no translation states on the PPPoE server. The prefix is directly accessible from outside. Now the customer LAN is assigned globally available IPv6 from the CPE (PPPoE client). I assigned PREFIX_FROM_ISP as locally significant name for the delegated prefix, no need to match the name on the DHCPv6 server side. DHCPv6 relies on stateless UDP communication using UDP 546 and UDP 547 ports. As stated in the RFC 3315 this makes DHCPv6 particularly vulnerable to fake attack, in which SOLICIT messages are generated with random source prefixes. Using DHCPv6 Rapid-Commit mode, ONLY two messages are exchanged between the client and the server to get an IPv6 prefix. Below is the Scapy script used for the attack, though awkward, but do the job. You can enter manually the DHCPv6 sever MAC address from the local neighbor table of through a script by pinging all DHCP agents multicast address FF02::1:2. SOLCIT messages are sent blindly without even expecting any responses. and corresponding Link Local EUI-64 IPv6 address"""
""" Generates interface ID in EUI-64 format"""
""" Generates Link-local  IPv6 addres in EUI-64 format"""
Look already at the number of fake active clients! With a mask of /64 there are 18,446,744,073,709,551,616 hosts. Obviously the purpose is not to deplete the DHCPv6 prefixes; it will take a ridiculous amount of time to exhaust the pool. It is about CPU and memory resources exhaustion. 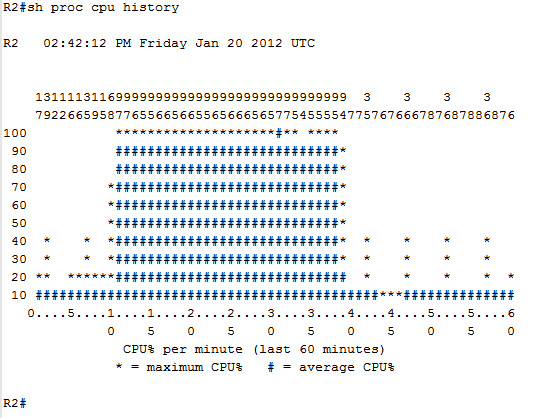 100% of interrupt processing caused by DHCPv6 and ND processes activities. OK, maybe the effect on CPU will not be so harmful with HW equipments, but each binding table association will take the same amount of memory. Thirty minutes later, the 128 Mbytes of our DHCPv6 router memory is depleted and the router starts firing syslog messages to signal the problem. Imagine what you can do with a more sophisticated piece of software or with HW tools like Ixia or Spirent. Though the DHCPv6 SOLLICIT messages consume insignificant BW, the harm is caused by the amount of memory allocated by each packet. The DHCPv6 server maintains an automatic binding table in memory to track the assignment of some configuration parameters, such as prefixes between the server and its clients. – 802.1x for layer2 authentication before even attending DHCPc6 process. – Secure ND (SeND): is a more complex architecture requiring crypto, SeND capable hosts and PKI infrastructure. At least an entire post will be dedicated to it. IPv6 device tracking to make sure neighbour table contains only live hosts. ND inspection: reject ND messages if MAC is unverifiable. 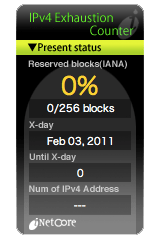 Depending on the expected number of IPv6 users, you can set ND cache limit globally or per interface basis. Prefix delegation gives the possibility to centrally control IPv6 addresses used in remote sites. Router R1 acts as the primary DHCPv6 server for the client router R2, which in turn acts as DHCP server for final clients. For example R1 can be a service provider MPLS PE (Provider Edge) router, R2 a client CPE (Customer Premise Equipment) router and final DHCP clients (router R3 in our case). R1 controls which prefix pools to delegate to a remote router after matching the configured client DUID (in our case 00030001CA02188C0008) present in the SOLLICIT message received from the client. The DHCPv6 server functionality is enabled on the interface fa0/0 facing R2, the intermediate server that will receive the delegated prefix 2001:DB8:23::/48. 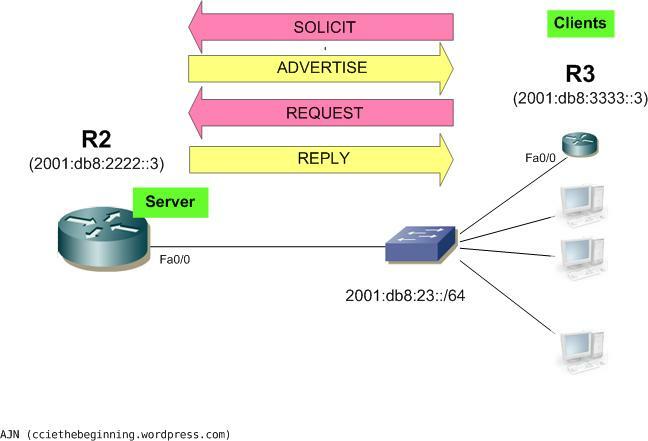 Router R2 interface fa0/1, facing the client R3, acts as a gateway router by announcing addresses from the delegated pool after assigning an interface ID to itself first, in this case (::2). And the client receives a prefix through SLAAC Router Advertisement. DUID uniquely identifies the pair (client, server), it is based on the client and the server link-local address and the lowest numbered interface MAC. DUID which remains the same across reboots. "DHCP clients use DUIDs to identify a server in messages where a server needs to be identified." a device's DUID should not change as a result of a change in the device's network hardware." "DUID is that the DUID must be globally unique"
This configuration is useful in case your DHCP server is not in the same segment as DHCP clients. R1 is the DHCP server, R2 is the DHCPv6 relay agent and R3 is used as a DHCP client. This is a common LAN Deployment model in which DHCPv6 is used to advertise DNS and domain name and IPv6 prefixes are assigned using classic SLAAC (Stateless Address Auto-Configuration). The Client gets the prefix from ND protocol (Network Discovery) through RS (Router Solicitation)/RA (Router Advertisement). The Server sets a special flag in RA message to inform the client that it can get other stateful information like DNS and domain name through DHCP request. The following four posts are dedicated to DHCPv6 deployment. For the reasons I mentioned in the previous post, I used IOS version 12.4(24)T for all routers. the client receives IPv6 prefix, DNS server and domain name through DHCP. the client receives IPv6 prefix through SLAAC, but gets the DNS server and domain name through DHCP. clients are not in the same segment as the server. a centrally located DHCP server controlling prefix delegation to intermediate DHCP servers. For this classic client-server DHCPv6 model, I deployed both modes rapid and normal commit. The Client asks for an address by sending SOLLICIT message and the Server responds with the address in REPLY message. The other messages used in Normal-commit, the default mode, are used in an environment with redundant DHCPv6 servers so they are informed of the allocated addresses to avoid duplicate address assignment. After the assignment, the server is aware of the client. The client is pointing a static route to the DHCP client interface, because it is a point-to-point segment, no next-hop is needed. The ADVERTISE message proposes a prefix to the client and waits for a REQUEST message from this last (destined to all DHCP agents FF02::1:2). This way, all DHCP servers will be informed of the new IPv6 address assignment.